← What Will the New Year Bring? For a while now, I’ve been puzzled by my lingering affection for Family Guy. The first time I saw it, it seemed like a blatant Simpsons rip off and I ignored it untill about seven or eight years ago and then rapidly caught up with the whole series. Interestingly I haven’t been able to stand the Simpsons for over a decade and long for the franchise’s death. The first 10 or so seasons were very good and often great and then… the long slide began into blahdom and I can’t even imagine watching it now and I don’t even want to watch the old good episodes anymore. But while the basic machinery of Family Guy is also worn and creaking and moaning and held together with scotch tape and spit I can still watch and enjoy it. Don’t worry about him, he gets killed all the time. It was while watching a youtube channel (a critic of animation who will remain uncited here) that it finally began to click. This critic hates the show with a passion and while watching some reviews of episodes he especially hates I got it. The critic is a normy and probably a millenial and is worried about things like characterization and continuity and plotting and so of course he hates Family Guy and so of course I don’t mind everything he hates because I’ve never watched the show in terms of plot or characterization (beyond the barest stereotypes) because that’s what it’s about. For me, I know realize, Family Guy takes place in something like a suburban American Dream Time where nothing is permanent, real or unreal. 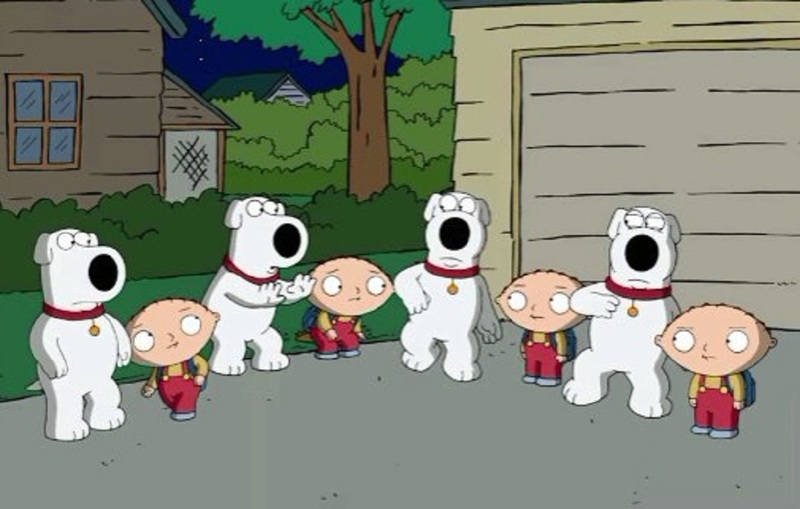 Peter and Stewie are both Tricksters ruled by their momentary desires and engaging in wanton destruction (Peter and his fixation of the day or week or moment) and creation (Stewie and his inventions). The other characters play off these dual tricksters as antagonists (Lois) or sidekicks (Brian). Seen this way the lack of continuity or plotting or consistence is not a fault but simply part of the medium just as the gross out or shock humor in the cutaways is part and parcel of the Trickster’s modus operandi (as is the frequent gender bending the two characters engage in). I’m sure that no one intended Family Guy to become this type of show but it’s interesting that it has more or less on its own evolved into a mythic time setting with characters that never develop or change or learn. What’s interesting is how this can still work at the pure level of entertainment. Family Guy’s hardly great art (or even very good a lot of the time) but I’m glad I now understand a little better why I can still enjoy it. This entry was posted in Uncategorized and tagged internet, tricksters, tv nation. Bookmark the permalink.